Here’s an interesting article we found from Healthcare Informatics – Still Work to Do Connecting Medical Devices to EHRs. Years ago, in the 2014-2015 timeframe, overinflated predictions were being made about the number of “Internet of Things” devices which would be connected to the internet by the year 2020. 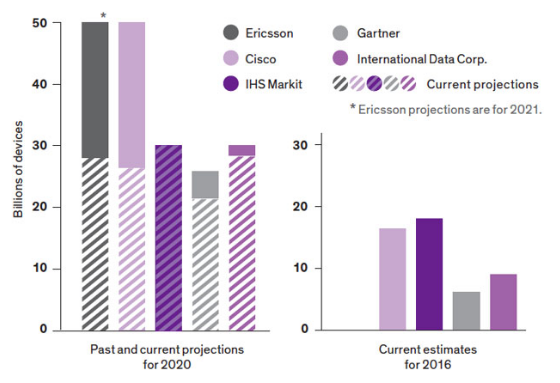 A number which got thrown around a lot was, “50 Billion.” This number came from Ericsson and Cisco and has since been revised down to 30 Billion by 2020. While the number of devices which can accurately be forecasted to appear has gone down, no one believes that there will be fewer devices connected, and perhaps, more importantly, no one believes that the amount of data coming from these devices will slow down, as bandwidth costs (both cellular and traditional) continue to go down. In order for a particular clinical or business model surrounding a device to make sense, it has to have either a, “curative” reason for being, meaning that it is actually improving some health outcome, or a “cost” reason for being, which means that at some point along the value chain it has to save someone cost. Often in order to prove out either curative or cost benefits in the grand scheme of things, we have to be able to point to a large data set, often a historical data set, and be able to compare device-derived data to a previously collected patient or medical performance data to come up with anything meaningful. As the article discusses above, getting access to patient data is not really a viable option, for a variety of reasons, including security concerns, bureaucratic concerns and legal regulations (such as HIPPA privacy laws). If a tree falls in the forest and no one is around to hear it, does it make a sound? If a connected healthcare or medical device is not really connected to other data if it’s just a standalone sensor yelling into the darkness, can it ever really be useful? The promise of connected healthcare, decreased medical errors, improved diagnosis is something that we would wish could happen, but the reality of making it happen is a very different thing. Register to attend our conference here at MedFuse.io for insights from real professionals which can help address some of these questions for the next five years.